Technology made easy. Development and application of COREP and FINREP XBRL taxonomies are two days of explanations, as an exclusive opportunity to gain comprehensive knowledge on development and application of electronic reporting of capital adequacy, solvency ratio and other financial information filed by credit institutions, at non-expert level. Laptop is not necessary. Solutions day. Off_the_shelf products and turnkey solutions may reduce both cost and time implementing filing systems based on standards as XBRL, supported by an industry of solutions and. The wheel has been already invented; simply choose the most appropriate existing solution for your needs. Presentations. The CEBS XBRL Operational Network members will explain the roadmap, designs, architectures, IT best practices, error handling, headers, and all the elements to be considered when implementing the new COREP/FINREP. The landscape will be completed by experienced experts. Supervisors, experts in supervision/filing (IT and accountants as well), project managers, solution providers, vendor representatives and consultants. Workshop is oriented to people involved in COREP/FINREP implementation. All interested parties are welcomed, but we have only 70 seats available, of which a number has been pre-booked for Supervisors and full week attendees. Download the Workshop announce form here. Last seats available for Presentations days. Please consider register only for Technology made easy and Solutions day. See here the list of recommended hotels. A number of rooms has been blocked until 12 October 2009. Both Hotel Rathauspark and Hotel Mercure Josefshof are located close to the Oesterreichische Nationalbank (Workshop Venue). Please book directly your hotel. 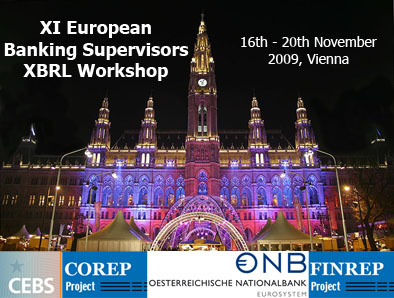 Please indicate "XI European Banking Supervisors XBRL Workshop" when booking the room. See here the airport transfer indications.